Two weeks ago, in the hour before dawn, we arrived at our new... ahem, OLD home. 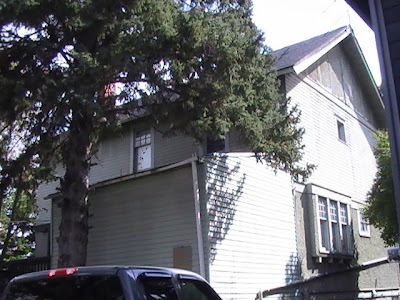 I have spent some time getting to know this old house and have given her the moniker, Edith. I wanted to share some photos of her with you and perhaps even share some of our adventures. 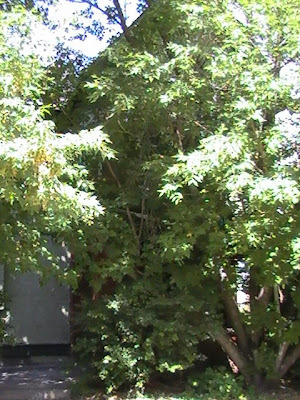 I could not show you a clear photo of Edith's face because of all the lovely trees growing right in front of her. Edith can't even be seen from the street, she's so hidden in foliage. The above photo is the best I could get to let you see how she appears as you approach her. The living room windows are on the lower left and the hint of red bricks is the arch entryway which leads you to the front door. Edith really is behind all that greenery! 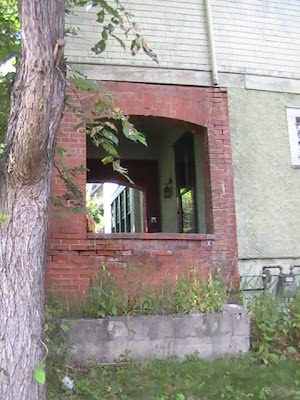 The front door is located right in the most thickly obscured part. 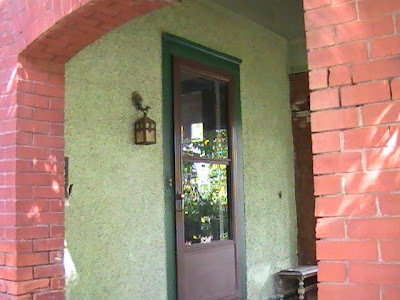 Here's Edith's front door and partial shot of the red brick arch. During the first few days here, I made an amazing discovery in the farthest reaches of the backyard. 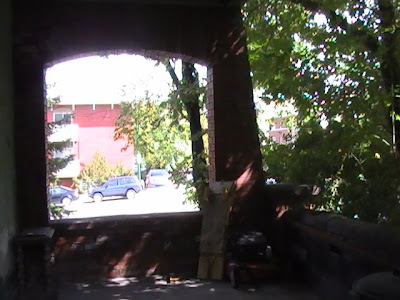 Iron gates that use to hang across this front archway were now being used as a fence. Such a shame that ironwork doesn't still hang from those bricks. Edith had a grand entryway once. This is the view when you enter the archway and look east. 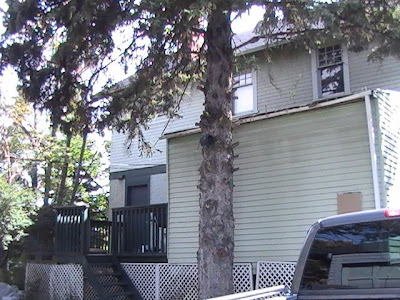 Edith is the house on the corner of her street, but right beside her property line is a small city owned linear park that is chock-full of more trees. That means that Edith has trees on three sides, giving us plenty of nature to view out her many windows. I stood in the park to take this shot of the arch on the other side of the front door. This shot is of Edith's eastside (the one that is alongside the park). 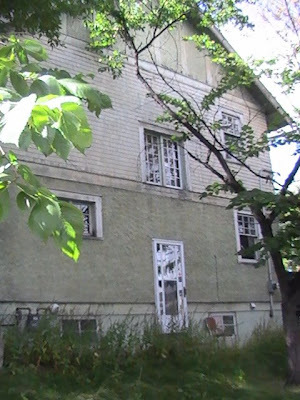 Notice she has windows on three levels as well as a side door? Right above that door is my favourite set of windows in the whole house. Those beauties on the landing halfways between the main level and the upstairs. From first sight, I was in love with these windows that open inwards and allow so much light and fresh air into the house. 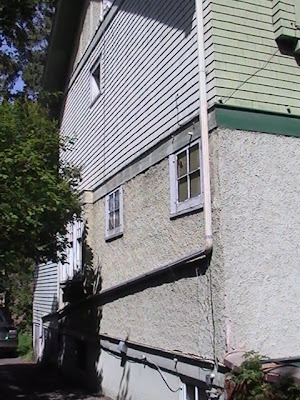 This is the same side of the house, just further back to show you the deck which is attached to the back of Edith. 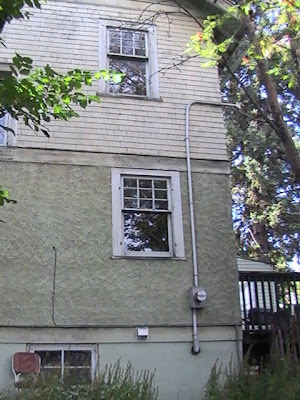 Also, the long narrow windows belong to the kitchens on the main and second floors respectively. 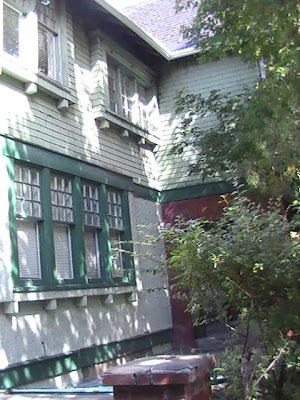 Here's Edith's west side, as seen from the driveway. The windows here belong to the living room (the small ones are from either side of the fireplace) and further back are the ones belonging to the dining room. Again, this is the view of Edith's west side only this time I'm standing at the end of the neighbour's driveway and looking back at the house. You can see the dining room set of three windows more clearly here with the small upper window belonging to the bedroom where I'm currently typing this post from. Sometime ago, an additional room was added to the back of Edith and you can see it as the sided structure with no windows. This is how Edith looks at the back. There's the deck which can be accessed through the door from the main floor kitchen, with a set of smaller windows located straight up from the door belonging to the second floor kitchen. 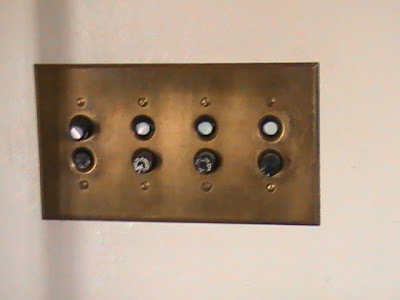 How about these light switches? They are located on the wall in the front foyer. The switch on the far left operates the porch light outside the front door. 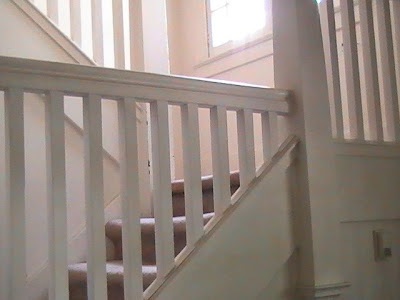 My last photo for this post shows the staircase to the upstairs which is what you see when you enter through Edith's front door. See all that bright sunshine coming through my favourite windows on the landing? Heavenly. Now, I do have more photos of Edith that I can share, but I will save them for another post. You also read that we've been having some "adventures" with our move. I've been debating whether to give you the nitty gritty on all that has happened in our two weeks here because, well it isn't all happy stuff. Some of it has left me in tears. Today, I think I shall just leave this post as it is with photos and happy thoughts. I have missed you all here in blogland and hope to get caught up with you and get back to posting regularly. I won't promise any sewing projects just yet. We're not unpacked because we will be leaving Edith (due to certain specific "adventures" that have happened in her). Packing and Quilting Nearly Complete! 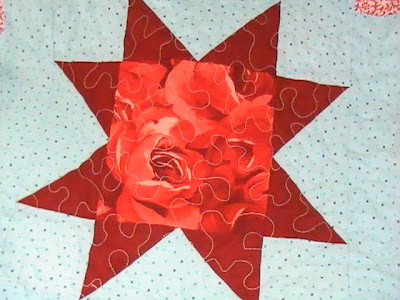 I'm making one last appearance in blogland before we move in a couple of days and I wanted to give you a peek at the progress on my quilt. 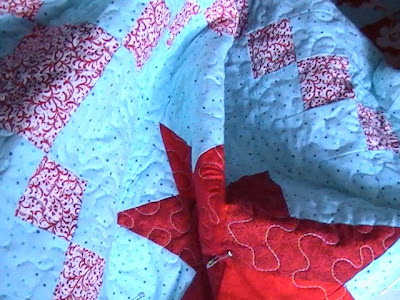 After much packing and organizing, I cleared a space on the living room carpet to baste my quilt top from the Star Quilt along. I decided to stipple quilt the whole quilt top. 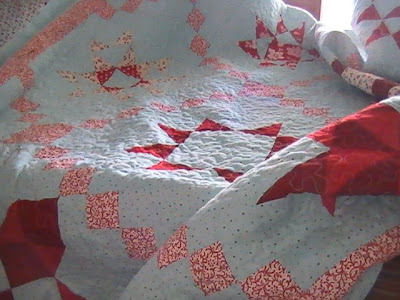 I managed to get all but about 7" from the outside edges quilted up in one evening. The plan is to finish the last bit today because we will be disassembling the table my sewing is on. I managed to keep my sewing out right until the very end of packing up the household! My hope is to have a finished quilt to blog about when I get back online after relocating. Until then, I thank you all for your best wishes in our move and I look forward to reconnecting with you here in blogland as soon as I get settled in.